Card Text You control this creature. What happens when I use Collar of Subordination to take control of a creature? You become the controller of that creature, adding it to either flank of your battleline, while maintaining its current status (e.g. exhausted, ready, stunned, etc.) If the creature leaves play, it is returned to its owner’s appropriate out-of-play area (such as a hand, deck, archives, or discard pile). If that creature belongs to a house not included in your deck, you may now choose that house as your active house during step 2 (“Choose a house”) of your turn. What happens if I play a Collar of Subordination on a creature that already has a Collar of Subordination? You take control of that creature. 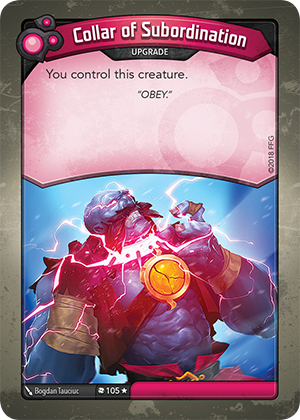 If multiple effects that take control of a card are used on the same card, the most recent effect takes precedence.